While all the attention from Apple’s big event today is quite rightly falling on that rather impressive Retina 5K iMac as well as the updated iPad Air, there is one particular feature of Apple’s new tablet that seems to have almost been squeezed in under the radar. 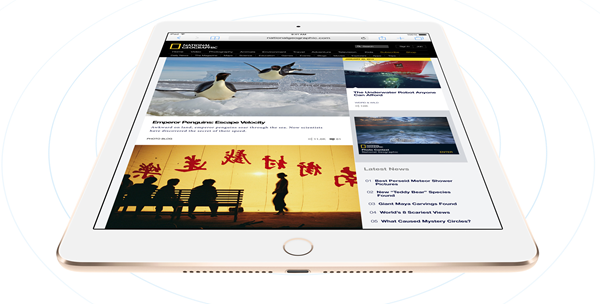 Apple made no mention of it during the announcement of the iPad Air 2 and it was instead left to languish amongst all of the other features laid out on the product’s Web page. The feature in question is the new Apple SIM, which appears to allow users to not just choose 4G data tariffs on a whim just as they have been able to do on all previous cellular iPads, but to also switch between carriers at the drop of a hat also. Previously, users would have to choose which carrier they wanted to go with before making their iPad purchase, but the inclusion of a SIM card that works with all supported carriers – in the U.S. and UK currently – out of the box is something new. Looking down the list of carriers that are in on Apple’s new movement to simplify how cellular data works on tablets there is one notable exception in the fact that Verizon is apparently not playing ball. 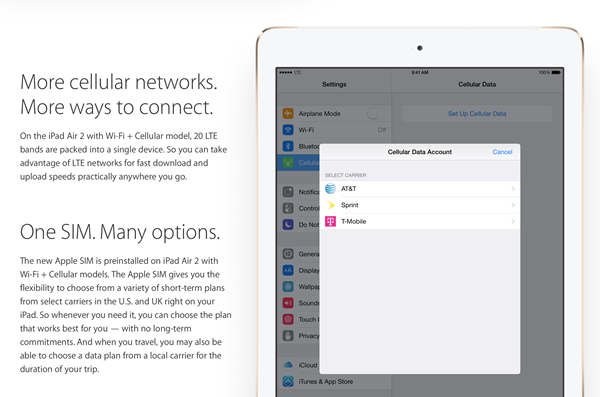 In the United States, owners of the new iPad Air 2 with Apple SIM will be able to choose between AT&T, T-Mobile and even Sprint, but we can only assume that those wanting to sign up to Verizon will need to put their own SIM card in, and it’s interesting that the carrier didn’t want to join with its competition in being part of Apple SIM. With literally all of its major competition signed up, would it not have made more sense to have the Verizon logo front and center alongside the rest? Whatever the reason, if you do indeed want a Verizon iPad Air 2, things won’t be quite as simple as they should have been and we suspect Verizon is squarely to blame for that. Now wouldn’t it be great if we had a SIM card just like this one to switch between carriers on our iPhones? We can wish can’t we? good way 😉 Apple think better. This is crazy but mega best thing I ever seen with carriers.. The SIM card will never “die” this way in the Philippines, no doubt about it. Mainly because here, most people who use any kind of phone/tablet use prepaid SIM cards. Sorry, Apple.